Protein and carbohydrate metabolisms are affected during pregnancy and maternal insulin resistance can lead to gestational diabetes. During pregnancy, the metabolism shifts to provide the growing fetus with more nutrients as well as to ensure the development of the uterine lining and breast glandular tissue. Hormonal changes during pregnancy increase nutrient requirements and fat deposition. Insulin resistance can develop and lead to gestational diabetes. cortisol: A steroid hormone (also called hydrocortisone) produced by the adrenal cortex, that regulates the metabolism of carbohydrates and maintains blood pressure. gestational diabetes: Also called gestational diabetes mellitus (GDM), it is a condition in which women without previously diagnosed diabetes exhibit high blood glucose levels during pregnancy (especially during the third trimester). lactogen: Human placental lactogen (HPL), also called human chorionic somatomammotropin (HCS), is a polypeptide placental hormone. Its structure and function is similar to that of human growth hormone. It modifies the metabolic state of the mother during pregnancy to facilitate the energy supply of the fetus. During pregnancy, both protein metabolism and carbohydrate metabolism are affected. One kilogram of extra protein is deposited, with half going to the fetus and placenta, and another half going to uterine contractile proteins, breast glandular tissue, plasma protein, and hemoglobin. An increase in nutrients is required for fetal growth and fat deposition. Changes are caused by steroid hormones, lactogen, and cortisol. Increased liver metabolism is also seen, with increased gluconeogenesis that leads to increased maternal glucose levels. Maternal insulin resistance can lead to gestational diabetes. Gestational diabetes (or gestational diabetes mellitus, GDM) is a condition in which women without previously diagnosed diabetes exhibit high blood glucose levels during pregnancy (especially during the third trimester). There is some question whether the condition is natural during pregnancy. Maternal insulin resistance can lead to gestational diabetes. This type of diabetes is caused when the insulin receptors do not function properly. This is likely due to pregnancy-related factors, such as the presence of human placental lactogen that interferes with susceptible insulin receptors. This in turn causes inappropriately elevated blood sugar levels. Gestational diabetes generally has few symptoms and it is most commonly diagnosed by screening during pregnancy. Diagnostic tests detect inappropriately high levels of glucose in blood samples. Gestational diabetes affects 3–10% of pregnancies, depending on the population studied, so it may be a natural phenomenon. 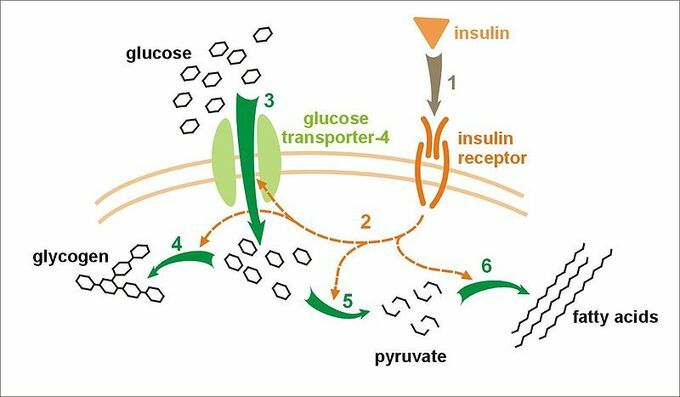 Effect of insulin on glucose uptake and metabolism: Insulin binds to its receptor (1) on the cell membrane which in turn starts many protein activation cascades (2). These include: the translocation of the glut-4 transporter to the plasma membrane and an influx of glucose (3), glycogen synthesis (4), glycolysis (5) and fatty acid synthesis (6). Babies born to mothers with untreated gestational diabetes are typically at an increased risk of problems, such as being large for gestational age (which may lead to delivery complications), low blood sugar, and jaundice. If untreated, it can also cause seizures or still birth. Gestational diabetes is a treatable condition and women who have adequate control of glucose levels can effectively decrease these risks.